Cargolux Airlines International (Luxembourg) on September 28 took delivery of brand new Boeing 747-8R7F LX-VCM (msn 61169). The new delivery was flown to Luxembourg (above) and is in service between Luxembourg and Los Angeles via Prestwick. 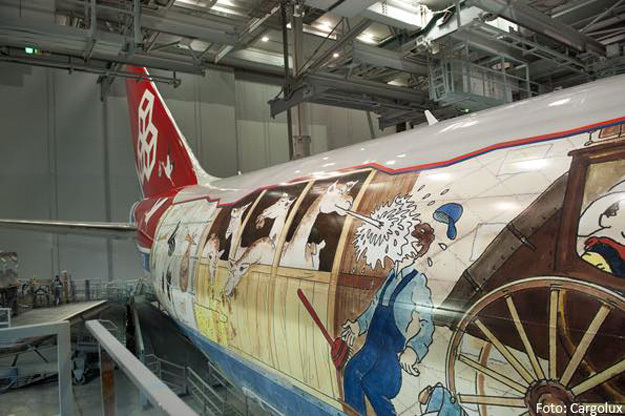 The new Jumbo freighter is painted in a whimsical “You name it, we fly it” special livery created by Belgian cartoonist Philippe Cruyt. 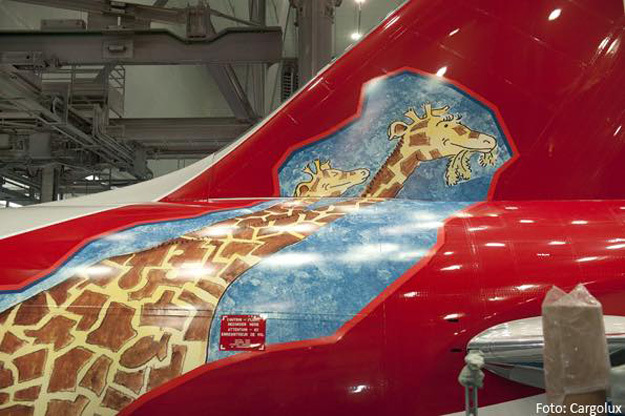 The logo jet is helping Cargolux celebrate 45 years of flying. 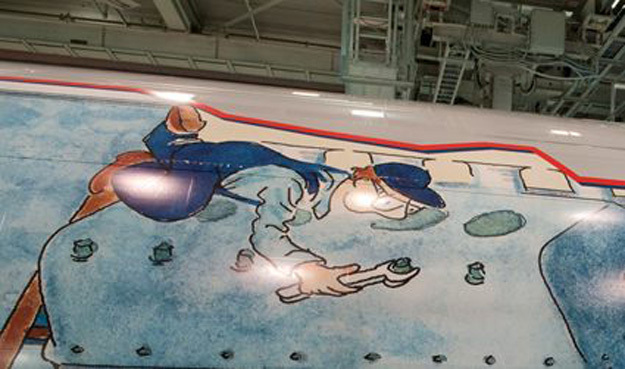 The logo jet displays some of the odd things the airline has flown in its history. 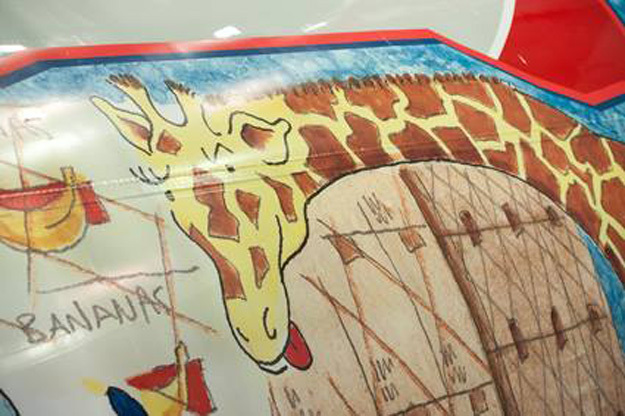 Cargolux Airlines, Europe’s largest all-cargo airline, celebrates its 45th anniversary with a special aircraft livery, created by Belgian cartoonist Philippe Cruyt, that was applied to its 13th 747-8 freighter delivered. The aircraft, LX-VCM, named ‘City of Redange-sur-Attert’, was handed over at Boeing’s Seattle plant on September 28 and arrived in Luxembourg on September 29 with a full load of cargo. As an undisputed leader in air cargo, Cargolux offers an extensive product range, covering everything from every-day cargo to shipments that require detailed attention, special treatment and expert handling. Backed by 45 years of experience, the highly specialized Cargolux teams can cater to the most demanding requirements customers may have. 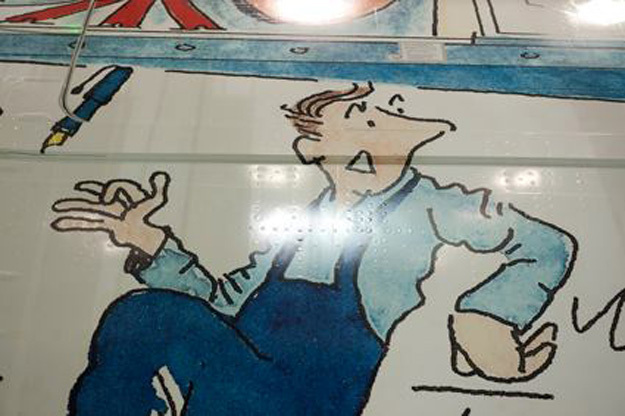 This ability is aptly portrayed in the anniversary livery on LX‑VCM that depicts in a humorous way the many facets of air freight shipments, routinely handled by Cargolux every day. 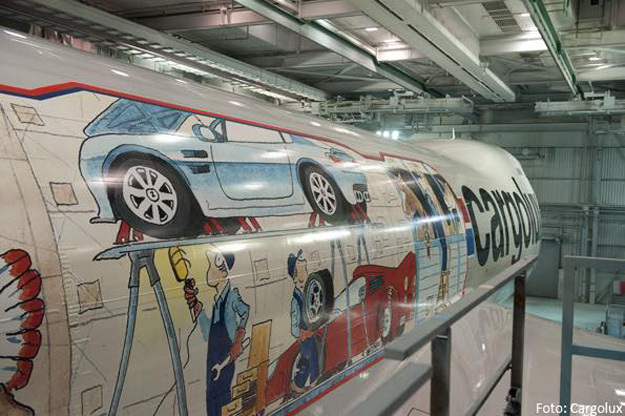 The decal on Cargolux’s new freighter is the biggest decal that Boeing ever applied to an aircraft, it consists of 460 individual parts. Phillippe Cruyt was born in Brussels, Belgium, in 1962. 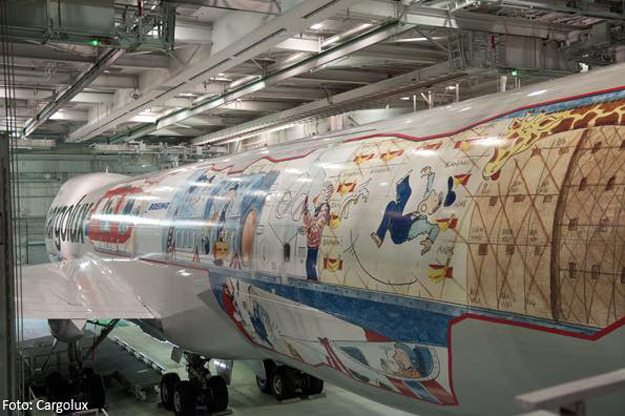 He has already illustrated a range of successful educational books on air freight and environmental topics, published by Cargolux in the early 2000s, as well as advertising and safety campaigns, calendars and posters for the airline. 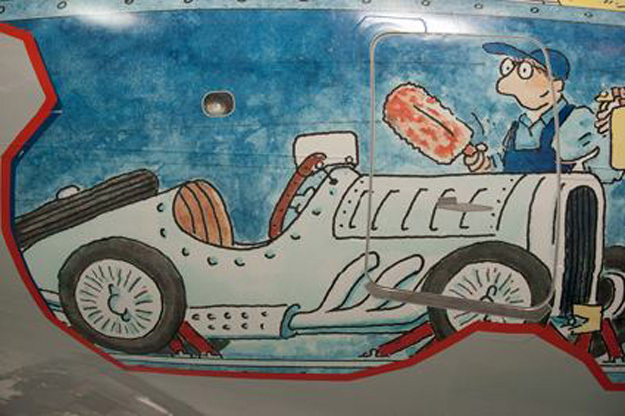 In addition, he has illustrated a range of books as well as published his cartoons at various exhibitions throughout Europe. Currently, Mr. Cruyt divides his professional time and energy between cartoon illustrations for children’s and educational books or designing communication messages with a touch of humor. When he is not drawing, Mr. Cruyt plays clarinet and tenor sax in his jazz group, The Creole Shakers Trio. Over the last 45 years, Cargolux has grown to become Europe’s largest all-cargo airline with 828,658 ton of cargo flown in 2014 and a fleet of 25 747 freighters. 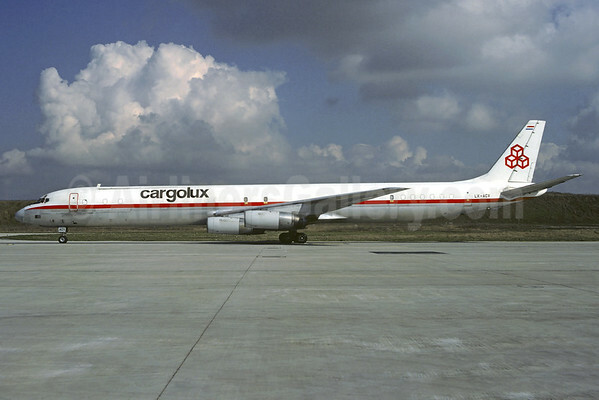 On March 4, 1970, Luxair, Loftleiðir, Salén and some private interests founded Cargolux and started operations from the newly established home base at Luxembourg airport with a handful of Canadair CL-44 freighters. The young carrier’s first flight on 10 March 1970 was routed Luxembourg – Stockholm – New York and carried a cargo of strawberries and iceberg lettuce. The airline was created to operate all-cargo ad hoc and sub-charter flights and the first years of operation proved that there was a need for the type of service that Cargolux was offering to its customers. Copyright Photo: Christian Volpati/AirlinersGallery.com. Douglas DC-8-63 (CF) LX-ACV (msn 45989) is seen at Paris (CDG). The CL‑44s soon gave way to bigger DC-8 freighters (above) and, in later years, Cargolux introduced the wide-body Boeing 747 freighter into its fleet, amidst much skepticism in Luxembourg and within the industry. However, the success of the operation eventually proved critics wrong. In later years, Cargolux became the first operator and launch customer of the 747-400F and the 747-8F. With more than 85 offices in over 50 countries, Cargolux today flies to over 70 destinations worldwide and employs over 1,700 people. 1970: Cargolux Airlines International is founded by Luxair, Loftleiðir Icelandic, the Salén Shipping Group and private Luxembourg interests. 1974: The maintenance division of Loftleiðir Icelandic is integrated into Cargolux, whose staff increased from 80 to 180 over night. 1978: The final CL-44 is phased out. Cargolux now operates an all-jet fleet. 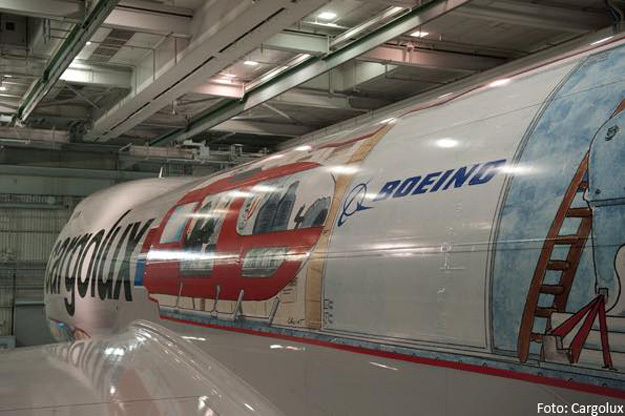 1979: Boeing delivers Cargolux’s first Boeing 747-200F, the second one arrives a year later. 1983: Cargolux’s CHAMP (Cargo Handling And Management Planning) computer system is introduced. 1984: The last DC-8 freighter is sold, while a third 747-200F is added to the fleet in 1986. 1988: Cargolux ranks among the 15 largest cargo carriers in the world, measured in freight tonne kilometers flown. 1990: Cargolux celebrates its 20th anniversary with an order for three new Boeing 747-400 freighters. 1993: With the delivery of the first two Boeing 747-400 freighters, Cargolux becomes the first airline in the world to operate this state-of-the-art aircraft. 1995: Cargolux celebrates its 25th anniversary. The fleet of modern 747-400 freighters is steadily expanded over the coming years; the 16th and last unit is handed over in 2008. 2005: Cargolux and Boeing announce the development of a new, advanced version of the 747 freighter, later to become the 747-8 series. 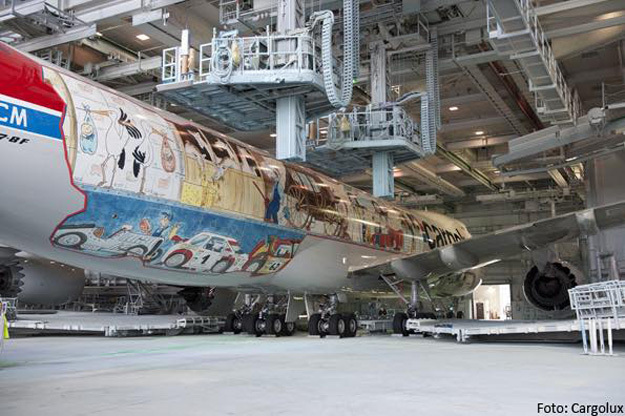 Cargolux is a launch customer for this new 747 type with an initial order for 10 aircraft. The company later orders five more 747-8Fs. 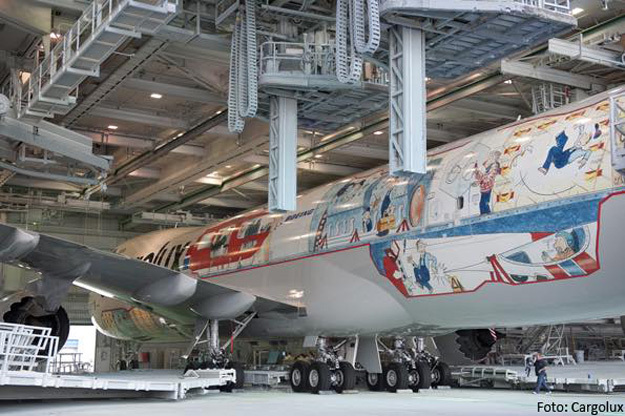 2009: The Cargolux Maintenance Division moves into its new maintenance hangar that offers modern facilities and space for two 747/A380-sized aircraft. Cargolux enters into a strategic partnership in Italy to create Cargolux Italia for intercontinental all-cargo services from Milan’s Malpensa airport. 2011: Qatar Airways takes a 35% equity interest in Cargolux, but decided in November 2012 to sell its stake. The State of Luxembourg acquires these shares on an interim basis. 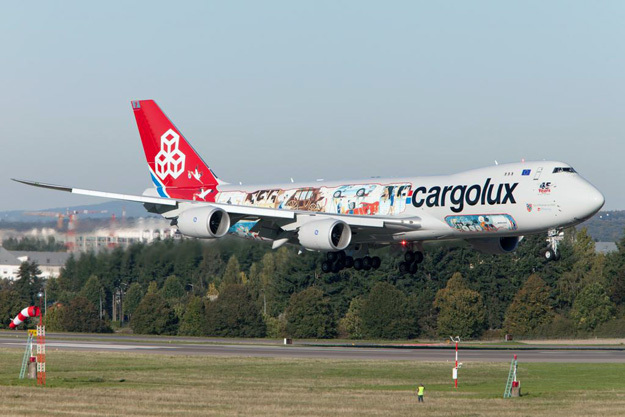 Some six years after signing the initial order, Cargolux is taking delivery of its first two Boeing 747‑8 freighters on 19 and 21 September. 2014: Cargolux achieves a number of crucial goals, including the conclusion of a commercial cooperation agreement with HNCA, who acquire 35% of the Cargolux shares and the successful introduction of services to and from Cargolux’s new hub in China, Zhengzhou. 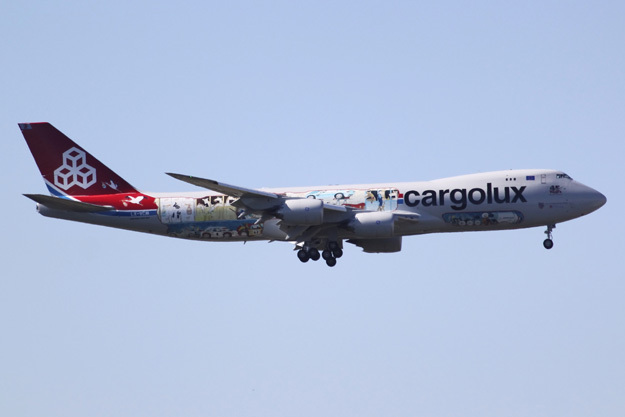 2015: Cargolux celebrates its 45th anniversary. The airline operates the largest fleet in its history and routinely records one of the highest daily aircraft utilization rates in the industry. Cargolux now operates seven weekly frequencies between Luxembourg and Zhengzhou and introduces its first dedicated transpacific service between Zhengzhou and Chicago. With the acceptance of 747-8F LX-VCM, Cargolux operates one of the youngest and most efficient freighter fleets in the industry. All photos by Cargolux (except below). Bottom Copyright Photo: Joe G. Walker. LX-VCM arrives at Seattle/Tacoma to take a full load of cargo to Luxembourg. This entry was posted in Cargolux (Luxembourg) and tagged 45989, 61169, 747, 747-8, 747-800, 747-800 Intercontinental, 747-800F, 747-8F, 747-8R7F, Boeing, Boeing 747, Boeing 747-800, Boeing 747-8F, Cargolux, Cargolux Airlines, Cargolux Airlines International, Cargolux Maintenance Division, CDG, DC-8, DC-8-63, DC-8-63F, Douglas DC-8, Douglas DC-8-63, LUX, Luxembourg, LX-ACV, LX-VCM, Paris, Philippe Cruyt on September 30, 2015 by Bruce Drum. McDonnell Douglas DC-8-63 (F) 9G-AXD (msn 45927) displays the new identity at Ostend/Brugge. Copyright Photo: Rainer Bexten. Air Charter Express (Accra and Ostend/Brugge) has changed its name again, this time it is Meridian Airways. This entry was posted in Air Charter Express, Meridian Airways and tagged 45927, 9G-AXD, Air Charter Express, Airliners, Airlines, DC-8, DC-8-63, DC-8-63 (F), DC-8-63F, McDonnell Douglas, Meridian Airways, Name Change, OST, Ostend, Rainer Bexten on September 27, 2009 by Bruce Drum.